Even though we're racing towards the end of 2017 there are still plenty of records to swoon over from last year. 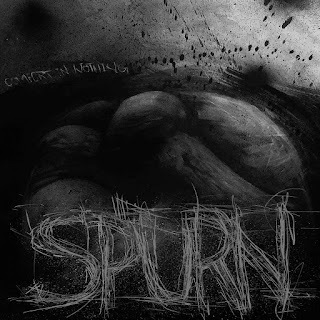 Spurn's "Comfort In Nothing" is on of them. You may think that swoon is a strange word to use about a grind band but I stand by it! These Canadian noise makers released their first demo in September 2015 and then followed it up less than twelve-months later with their debut full-length. They're part of new wave of bands that are cropping up in Canada right now, so it's a good time to give them your attention. Fast, angry, riffy music is the perfect accompaniment today. Spurn is more so much more than that though, as their techy time-signatures reign supreme on album opener Spoiled Failures. Their’s is a sound that Mathcore Index would be proud of! The title-track highlights that earlier point with tight percussion and a mix of heavy and metallic guitar work that backs up the angrily delivered vox. It reminds me a lot of Leeds, UK band Tangaroa and I couldn’t be happier with that comparison. The collage of sound that’s created by Spurn is both challenging and exhilarating. They start off by heading down a sludge/pv direction on News Feed, before switching to punk rhythms and then to out-of-this-world bizarreness with a handful of tech-death riffs. I’m only three songs in and it’s already too hot to handle. Spurn’s grinding tendencies come to the fore on Reproduction. I can only imagine how sick this would be live. Maybe one day they’ll make it to the UK! The low roars and chunky instrumentation that kicks off Obsolete make it sound like early metalcore and indeed the song is about as brooding. The stop/start guitar work adds to the sense of venom. Quota To Meet is the fastest song on “Comfort In Nothing” and musically it’s one of the richest. The urgency that Spurn exhibits translates into a brutally intense delivery and thanks to the solid mixing/mastering, there’s no sense of weakness within the band’s armour. They really hit their stride on No Next Time, which pulls no punches. It contains a simpler structure in places but that just makes the technical parts stand out more. You just have to sit back and relish this record. By the time Old Man flails into view, you’re head is already beaten into submission from all angles. Dare I say that the intro to No Safety brings to mind the early musical phrasing on “Remission”-era Mastodon. They pepper the song with angular riffs and it all just fits together. Why am I picturing crazed strobe lights while listening to this? Album closer Refugees is Spurn at their most pissed-off. It seems to gather together every musical layer that they possess and turns them into a rage-fuelled barrage against the elite. For a song that barely two-and-three-quarter minutes, they fit a lot into it. As it dies down and reveals silence, you’ll either be panting for breath or comatose. There’s no middle ground. Keep Spurn close to your chest as they’re gonna get noticed soon, in a big way.